Legend has it that “love locks” that are hooked onto a bridge, a fence, a gate, or anything similar to these structures will grant eternal love to the couple who attached the lock. With initials inscribed and locks attached, couples walk away believing that their love will last as long as the lock does. 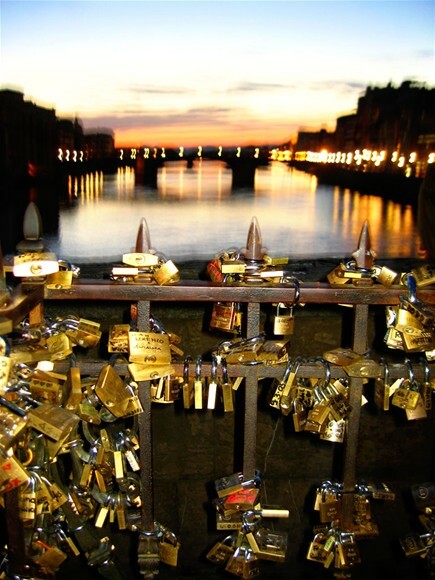 A particularly famous site of these “love locks” are found on the Ponte Vecchio Bridge in Florence, Italy. Here, couples used to attach their locks on, then throw the key so that it would rest in the depths of the Arno River for the rest of eternity. The thought in itself makes me shiver with delight! I love the idea of forever locking your love, declaring it to the world in such a quiet way. I’m supposed to relate this back to Othello, so I’m going to try and convince you how exactly I did that. The setting of Othello at the beginning of the play is Venice. Since Venice is in Italy, I thought I’d broaden my search to include Florence. Again, here goes my the romantic part of me raving, but wouldn’t it be sweet to think that when Othello and Desdemona eloped that they made a short stop at the Ponte Vecchio to attach their own lock as a symbol of their endless love? Now tell me that doesn’t make you smile.